Researching and deciding on which products to sell on Amazon can seem like a daunting task, especially for sellers that are new to Amazon, or simply new to the mind-boggling world of E-commerce as a whole. What you need is a reliable Amazon Product Research Tool. Where do you start? How do you source the most profitable products to sell on Amazon? How do you constantly monitor these products and analyze data? Does this sound time-consuming? It doesn’t need to be. The BigTracker Chrome Extension from BQool Inc. will help you to find profitable products. 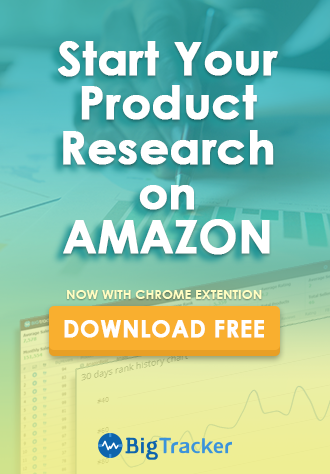 It simplifies your product research work with just one click and has proven to be a game-changing Amazon product research tool. Compared to traditional methods of product research, which often includes arduous tasks such as copying and pasting information from Amazon into a spreadsheet, the BigTracker Chrome Extension alleviates this time-consuming task. You can view comprehensive Amazon product data within seconds. The BigTracker Chrome Extension allows Amazon sellers to concentrate on selling products and making money, rather than spending hours, even days on administrative tasks. The BigTracker Chrome Extension aggregates all of your required information on to one single page while searching on Amazon. It calculates all of the data that you need, this data includes the average sales, average prices, and the average rank of the listings that you have searched. Furthermore, the BigTracker Chrome Extension automatically displays comprehensive information such as the Buy Box price, Sales Rank, Estimated Sales, Estimated Revenue, Number of Reviews and Amazon Fees. The BigTracker Chrome Extension also allows you to click to view the Historical Price and Rank Data. If you spot trending products that you’re interested in, you can add these products to the product tracker to start tracking. You can utilize the BigTracker Chrome Extension to search for profitable products and to uncover your potential competitors too. The BigTracker Chrome Extension has it all. Essentially, BigTracker is a product search engine. You can use it to analyze the sales metrics of certain products or to monitor a variety of product statistics. The BigTracker Chrome Extension has 2 options (Pro version and Lite version) and they are both available for Free Download now. Pro is available for a 14-day free trial, and Lite is available for Free Download until December 2018. Download Now! Setting up and utilizing the BigTracker Chrome Extension is as easy as ABC. Our step by step illustration below shows you just how simple it is to use. You can see from the graphic below that we have used the keyword ‘hangers’ for our Amazon search. Click on the BigTracker Chrome Extension Button. If you spot a trending product that you’re interested in, you can simply add this product by clicking the plus button to start tracking and monitoring this product. The BigMovers Scoring System is a spectacular sales performance indicator, forecasting the potential success of a product. 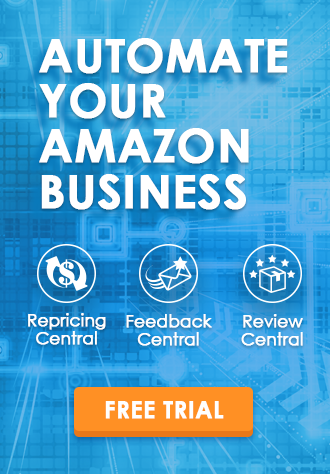 It is great for Amazon newbies, Arbitrageurs and Brand Sellers alike. Under the BigMovers header is a score for each product (on a scale of 1-99). This summarizes the potential of a product. This enables sellers to easily observe the projected success of a product and respond to the product score with further actions. These actions include tracking the product or using the ‘Attach Listings’ feature. The design of the “Scoring” system prevents you from wasting time and resources on selling “low” scoring products. A “High” score (80-99) Indicates that a product will relatively out-perform any perceived competition. This score suggests that sellers should invest in the near future. A “Low” score (1-20) Indicates that these products are perhaps not currently in demand in the market. This score suggests that no action should be taken by sellers who are scouting for product opportunities. “No Score” Indicates that these products are not yet included in the BigMovers big data analytics. 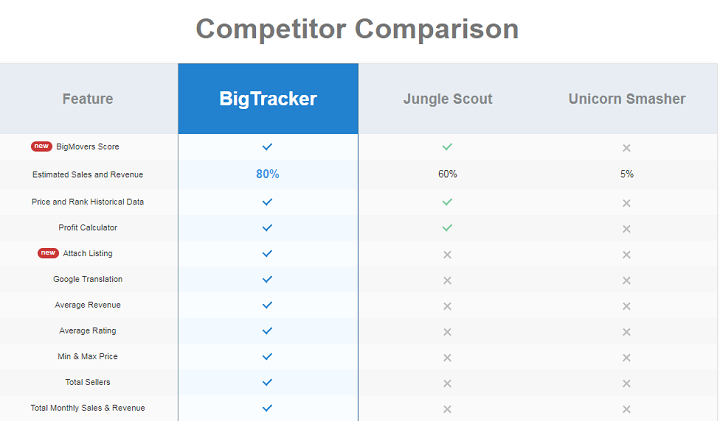 As you can see from the graphic below, BigTracker is lightyears ahead of its competitors. The BigTracker Chrome Extension has 2 options (Pro version and Lite version) and they are both available for Free Download now. Extension Pro is available for a 14-day free trial, and Extension Lite is available for Free Download until December 2018. Download Now to experience the best Amazon Product Research Tool for yourself.